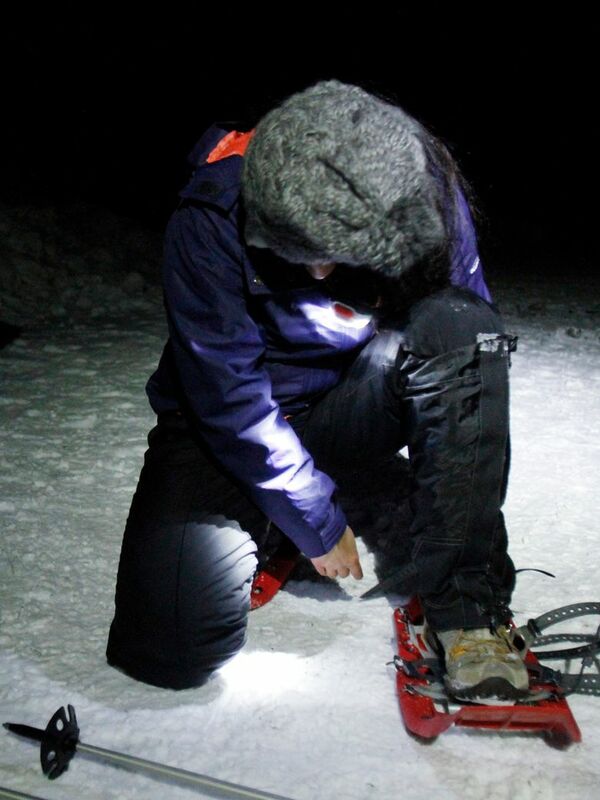 You’ll get plenty of exercise with a late-night snowshoe trip. But you’ll also find peace and beauty, and maybe even a full moon, if you’re lucky. I LOVE SNOW, and I love the moon. When I saw that REI’s Outdoor School offered an outing boasting a good dose of both, I jumped on it. The one thing that usually stops me from heading out into the wilderness is the prep, from the gear to the food. The nice thing about going with an organized outfit on a moonlight snowshoe tour is they drive you, provide the gear, make sure you stay safe — and will stop at the Sultan Bakery if your leaders are as nice as mine were. I packed my own snowshoes, though being REI, they provided snowshoes, poles and gaiters. We arrived after dark at Lanham Lake by Stevens Pass and got a quick talk on staying warm and safe. I loved the review of how to layer up in the winter, with the first layer to wick sweat, the next two to keep heat in and a shell to stay dry. I was a little disconcerted when leaders Kevin and David told us not to sweat. We were supposed to vent instead, or take off a layer. Not sweating seemed an impossible task, especially considering that I expected a vigorous snowshoe. They also reminded us to jump around and get blood to our extremities if we got cold. After a quick rundown on gear, we headed up. Snowshoeing is like slightly bowlegged walking. You might trip once or twice; I did in the parking lot. But once you get used to walking slightly wider than normal, it’s pretty straightforward. We had a fairly steep climb right away, which warmed us up. The biggest challenge in a group outing is pace. Kevin, who went first, paced us slowly to make sure the group hung together. I wanted to pick up the pace a touch, and reminded myself I was not on the outing to win any speed records. After a little while, I stopped wishing we would go faster and enjoyed the experience. I loved the crisp smell of the woods and cold, snowy air. Our leaders had holiday lights on their backpacks, which made them festive and easy to spot. Our headlights bounced through the dark woods, and the tree branches were heavy with snow. It was beautiful and quiet as our snowshoes squeaked over the thick snow. We had to cross a couple of creeks, and again the leaders came in handy, telling us exactly where to step. I could get used to this. The snowshoe was not terribly tough, but it was certainly vigorous. I almost started to sweat. It was cloudy the night we went, but once we made it to the lake, we could make out the full moon through the haze. We stood around on the edge of the frozen lake, eating sandwiches we each brought and drinking celebratory fizzy apple juice Kevin and David had hauled up. The nice thing about snowshoes is they spread out the impact both on the up- and downhill, so while there was some good incline, it felt manageable. The 3.2-mile round-trip snowshoe took longer than it would have on my own, but I’m not sure I would do it at night alone or even with one or two people. And snowshoeing at night is magical. With a group of 10, a midnight tromp through the woods feels fun and adventurous. I loved having guides who were experienced with avalanche safety. I especially loved having guides who drove us there and back. 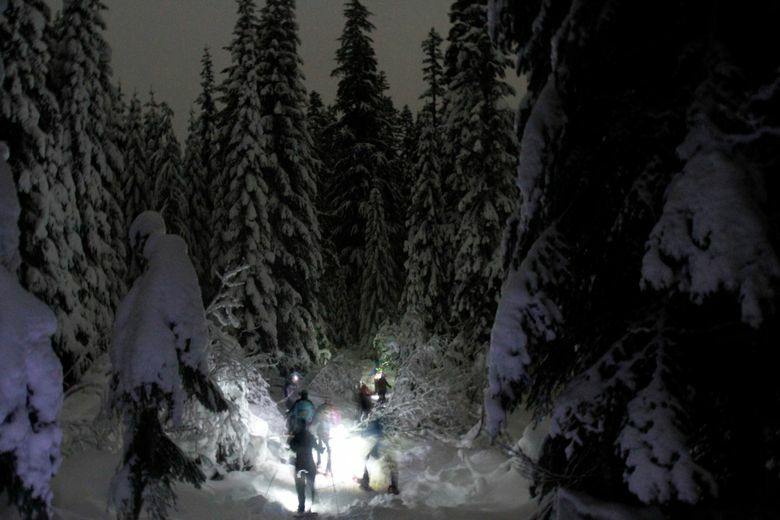 If you’re looking to try snowshoeing, or just want someone to guide you on a moonlit snowshoe, go for the snow, for the adventure and hopefully for the full moon. Nicole Tsong teaches yoga at studios around Seattle. Read her blog at papercraneyoga.com. Email: papercraneyoga@gmail.com.